Let’s be honest; anyone can make a hole in the ground and fill it with water. What really gets water lovers’ eyes popping are unique swimming pools that are unlike any other they’ve seen before. 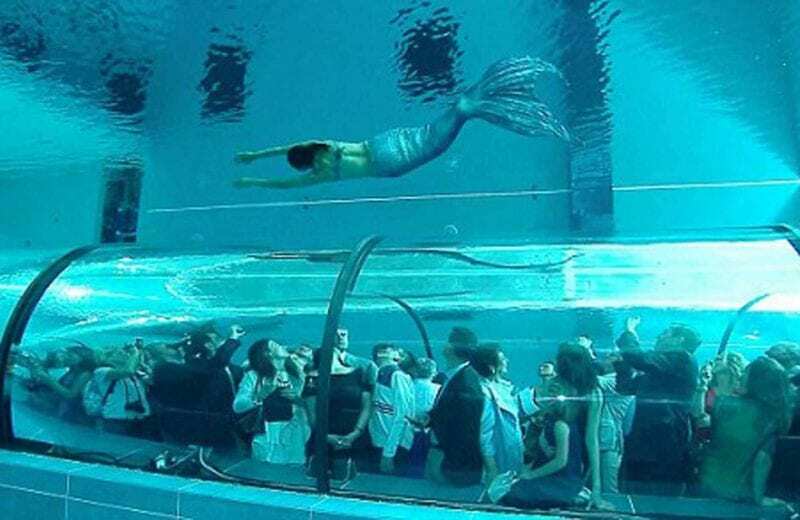 Because who wants to swim in a boring rectangular pool anymore? Whether they’re certain sizes, shapes, colors or depths, there are some truly epic swimming pools around the world – here are the best. Las Vegas is all about excess and pushing the boundaries. That’s exactly what they did with their pool in the Golden Nugget Hotel. But be warned: this pool is not for the faint-hearted. 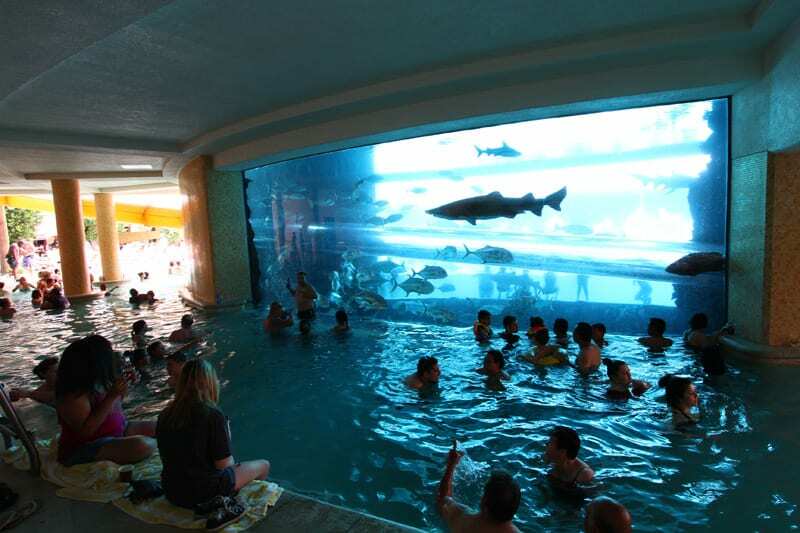 This unique swimming pool in the Golden Nugget wraps around a fish tank – but not just any fish tank. A shark tank. The wrap-around effect gives you the (slightly weird and scary) feeling of swimming with sharks – even though there’s a glass barrier between you and them. The pool cost a whopping $30 million to create, and even comes complete with a three-story waterslide that winds through the shark tank. We might give this one a miss. The Nemo 33 in Brussels holds the world record for being the deepest indoor pool in history. With multiple levels and depths, the pool is perfect for divers who don’t fancy donning a wetsuit. With the deepest area going down to 108ft, the pool also comes complete with underwater caves to swim through. Don’t worry if you’re not a fan of chlorine, though – Nemo 33 is filled using filtered spring water that is kept at a constant temperature of 96 degrees Fahrenheit. Don’t let the pretty ominous name put you off, because The Library Blood-Red Pool is truly beautiful. 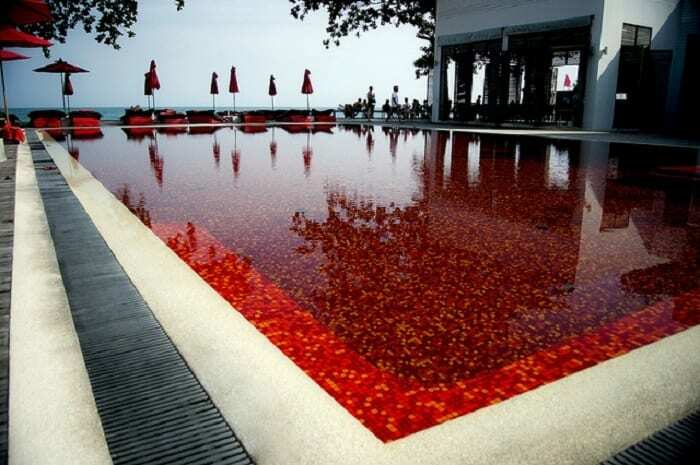 The resort and pool stands on the popular beach of Koh Samui in Thailand and looks over the aquamarine sea – a stark contrast to the Blood-Red Pool. However, the red water is really an optical illusion, created by the red, orange and yellow tiles covering the pool floor and sides. 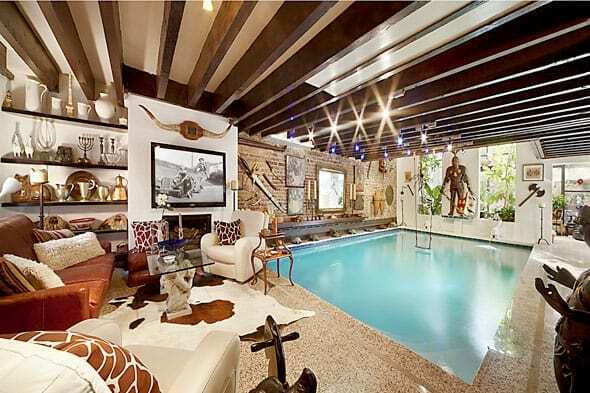 Yep, the Living Room Pool does exactly what it says on the tin. The 15ft x 30ft pool lies in the living room of an apartment in Manhattan. Standing next to your typical living room chairs and couches, candles, ornaments and even suits of armor, the pool looks pretty out of place. There’s even a swing hanging in the middle of the pool! The owner also has a second pool to house her turtles. 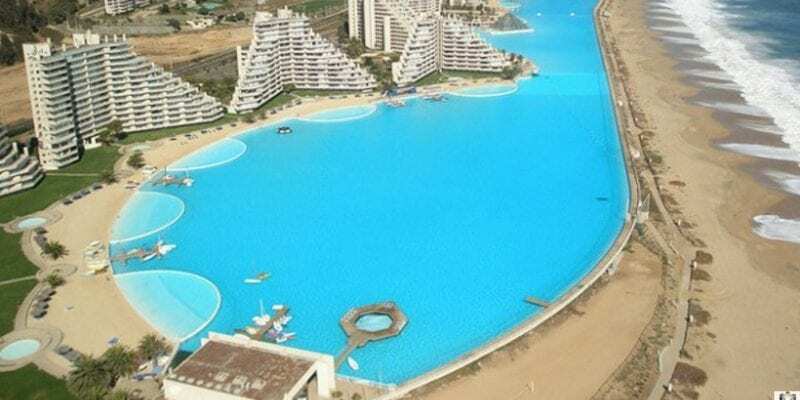 Although it was overtaken as the largest pool in the world a couple of years ago, the second largest pool in the world is extremely impressive. Located in the San Alfonso Del Mar hotel resort, this swimming pool spans more than one kilometer long (which is more than 20 Olympic sized swimming pools! ), carries over 250 million liters of water, and covers eight hectares. The pool cost a whopping $3.5 million to build, and even more to maintain each year. It’s so big you can even sail boats on it.